Changi Airport is a modern marvel of exceptional operational efficiency, boasting an experience beyond compare for its passengers. With first-class services and unrivalled capabilities, Changi Airport is Singapore’s long-standing pride and joy in aviation. Proud to join the stellar team that manages the airport is CAG Mid-Term Scholar, Aaron Wong. He takes us behind the scenes to tell us more about being a part of the CAG family. Since it started operations in the 1980s, Changi Airport has received over 530 World’s Best Airport awards. To Aaron, the honour of being part of such a prestigious organisation is what ultimately helped him make his decision to apply for a scholarship with CAG. 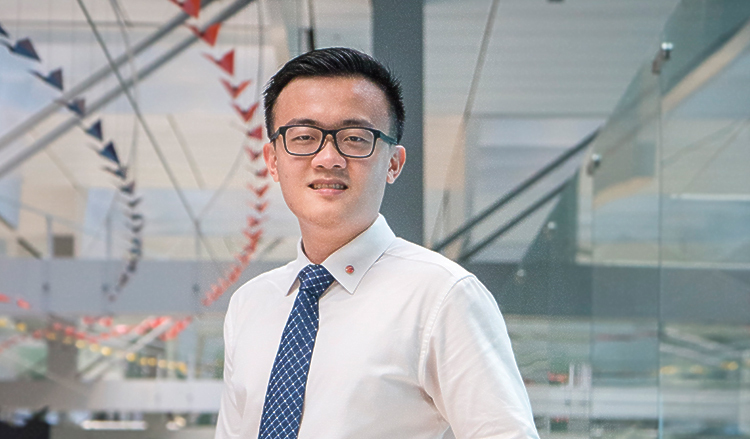 He enthuses, “The opportunity to join and learn from the very best made for a very attractive career proposition!” Beyond being a world-class airport, CAG is also the employer of choice in Singapore. Performing outstandingly in areas such as employee training, job security, and working atmosphere, it is no surprise that CAG has ranked first for the Hays Award for Employer of Choice at the HRM Awards in 2017, and Randstad Award in 2016. As a Mid-Term Scholar, Aaron made the decision to join CAG in his second year of university. “Like many others, I was unsure of the kind of career I wanted to pursue. At SMU, we had a mandatory internship requirement as part of our undergraduate curriculum. I started research on prospective companies, and that was when I came across the CAG Talent Internship Programme (TIP). The rest, as they say, is history!” he exclaims.